East Franconian (German: Ostfränkisch), usually referred to as Franconian (Fränkisch) in German, is a dialect which is spoken in Franconia, the northern part of the federal state of Bavaria and other areas in Germany around Nuremberg, Bamberg, Coburg, Würzburg, Hof, Bayreuth, Meiningen, Bad Mergentheim, and Crailsheim. The major subgroups are Unterostfränkisch (spoken in Lower Franconia and southern Thuringia), Oberostfränkisch (spoken in Upper and Middle Franconia) and Südostfränkisch (spoken in some parts of Middle Franconia and Hohenlohe). In the transitional area between Rhine Franconian in the northwest and the Austro-Bavarian dialects in the southeast, East Franconian has elements of Central German and Upper German. The same goes only for South Franconian German in adjacent Baden-Württemberg. 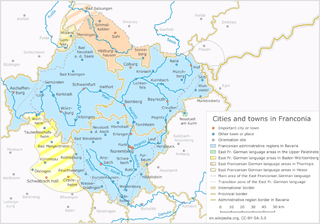 East Franconian is one of the German dialects with the highest number of speakers. East Franconian is researched by Mundartforschungsstelle der Bayerischen Akademie der Wissenschaften in Fürth. The scope of East Franconian is disputed, because it overlaps with neighbour dialects like Bavarian and Swabian in the south, Rhine Franconian in the west and Upper Saxon in the north. ↑ Hammarström, Harald; Forkel, Robert; Haspelmath, Martin; Bank, Sebastian, eds. (2016). "East Franconian". Glottolog 2.7. Jena: Max Planck Institute for the Science of Human History.